EcoCircuitos was invited to the Summit in the Jungle last week in Costa Rica where a group of selected companies meet for an exchange of ideas and experiences. G Adventures and Planetterra Foundation hosted this event that allows attendees and speakers from vastly different fields to cross-fertilize and draw inspiration from unlikely places. “It was an exciting opportunity to learn from different leaders about sustainable development and exhange ideas and experiences” said Annie Young. What is the Summit in the Jungle? From lush jungle terraces overlooking the beaches of Manuel Antonio National Park, participants gain insight into the importance of creating customized, long-term solutions to get to the root of the problems we face in the world today from people who are working to solve them. Driven by a passion to build a sustainable, scalable social world, this year’s Summit in the Jungle bring together global thought leaders committed to providing supportive solutions to local and global problems in one of Costa Rica’s most idyllic settings. Recommend reading: Bananas by Peter Chapman. The story of the banana and the people involved in its introduction to the United States is a very interesting one. Bananas were available in the US immediately following the Civil War, but they were a luxury item. In 1870 captain Lorenzo Dow Baker sailed his ship to Venezuela’s Orinoco River to drop off gold miners searching for riches near Ciudad Bolivar 300 miles upstream. On the way back he put in at Jamaica for repairs at became acquainted with bananas. He decided to take a cargo to the mainland where he was able to sell them for $2 a bunch netting him a profit equivalent to $6400 in today’s dollars. By 1871, he was the major banana exporter from the Caribbean. 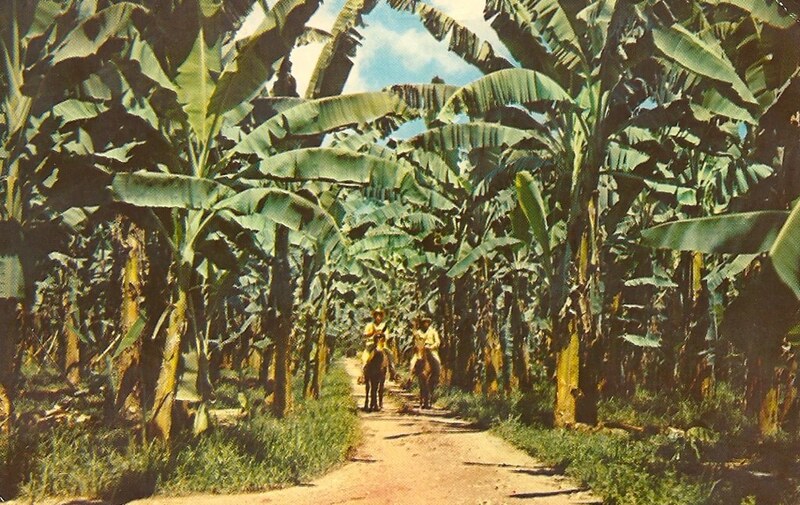 He bought land in Jamaica, planted acres of bananas and made a fortune. The banana he was planting was the Gros Michel. In the United States, Andrew Presto was a young importer of fruit and became a partner of Captain Baker. They added a fleet of refrigerated steam ships to replace the sailing ships in which so much fruit was lost and the boon was on. Meanwhile, Minor C. Keith had gone to Costa Rica to help his uncle build a railroad system between the capital of San Jose and the eastern port of Limon. When Costa Rica ran out of money for the project, Keith borrowed money from banks in England and offered to build the railroad at no cost to the Costa Rica government in return for a 99-year concession to run the route and full control of the port of Limon with 800,000 acres of land adjacent to the tracks, tax-free. On that land he planted bananas. Then Preston and Keith met. Preston was a genius at getting the fruit to market and Keith knew how to grow them. He continued making deals, as in Costa Rica, throughout Panama, Guatemala, Honduras, Nicaragua, Colombia and Ecuador. The two decided to merge and thus, on March 30, 1899, The United Fruit Company was born. As the company grew, it extended control over every facet of life in the regions where it operated. . The company rewarded those who cooperated, and began to behave more and more brutally towards those who did not. The lucky ones nicknamed the company “Mamita”. The unlucky ones called it “El Pulpo”. United Fruit did not like competition either and crushed rivals in price wars. By the late 1920s, United Fruit was worth over $100 million, had over 67,000 employees and owned 1.6 million acres of land. It had business interests in 32 countries and operated everything from churches to laundries, telephones, telegraphs, ship-to-shore transmission radio, schools, commissaries, housing, etc. It also had a powerful ally . . . the U.S. Government which made troops available when needed. The one thing United Fruit could not control was Nature. And the enemy was disease. Disease would devastate one plantation after another which had to be abandoned and a new one started. Finally, the solution was to stay a step ahead from the disease by creating a new, disease resistant banana. 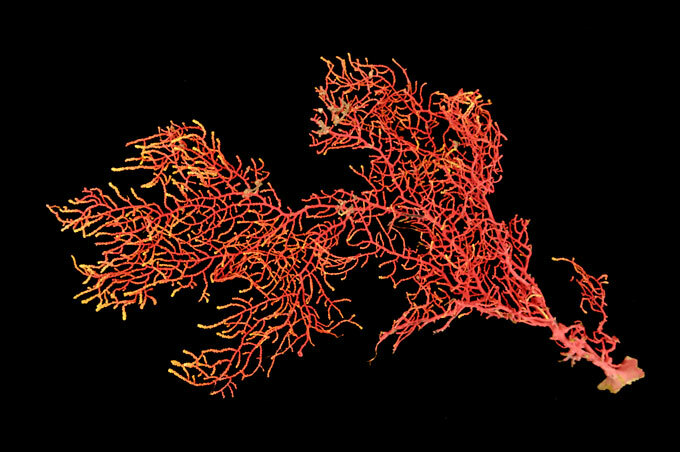 The disease was ultimately named “Panama Disease”, not because it originated there, but because it was there that scientist finally identified the fungus. Unfortunately, Panama got a bum rap. And the days of the Gros Michel banana were numbered. By 1947, the bigger Cavendish was replacing the Gros Michel. The Cavendish was resistant to Panama Disease and the other diseases that could attack it could be controlled by other means. But it is not as tasty. In the meanwhile, though, United Fruit played the role of “Mamacita” one day and “El Pulpo” the next. When they would open a plantation, they would, as mentioned before, create a town with every convenience. But they would pay the workers with script which could only be used to pay the rent of United Fruit housing and spent in the company’s store. All would be well until the “Panama Disease” would strike. Then, the company would move to a new area, dismantling every piece of the town and moving it to a new location. Distance would determine if the workers would be brought along or left behind to fend for themselves. This is when the company would be called “El Pulpo”. And their ruthlessness in breaking strikes went beyond cruel in many instances. They controlled the governments in Central America and had no qualms in using the U.S. government agencies, such as the CIA, to topple governments not favorable to them. The story of the banana and its producers is really a love-hate story. This year, the Central American Travel Market (CATM) will take place in Panama fom October 19 – 21. The Central American Travel Market (CATM) is a vocational meeting, which features tourist offers from the Central American countries. It offers the opportunity to establish relationships between providers of Central American tourism services and wholesalers from major international markets: Europe (priority market), Asia and Latin America among others. Promote the region as a highly competitive and multi-destination tourism venue in the international markets. Increase the Central America market-share of international tourists, in turn creating more jobs in the tourism sector, higher incomes and promoting local development in Central America. Annie Young Director and Founder of EcoCircuitos Panama will be attending CATM this year. To request an appointment with us, please email at annie@ecocircuitos.com For Panama, the CATM is a great opportunity for agents from all over the world to experience Panama and familiarize with this new and amazing Central America destination!! We are hosting a special event on October 21 from 5.00PM to 7.00 and involves hiking and a sunset cocktail in a privilege part of the city. If you are interested in meeting our staff and learn more about our sustainable products for Panama, please contact us at info@ecocircuitos.com as we have limited space. We are providing free transportation to the rainforest and back to the city on the day. We look forward to meeting you in Panama!!! Amigo de Panamá – Friend of Panama is an online training program for international travel agents. The expertise of travel agents on Panama as a product, is the number one priority “FRIEND OF PANAMA”. Digital training through the Panama current information, provides access to the travel agent through advanced Internet, using technology. This new model of training consists of brochures in digital format that serve as orientation guide and travel agent at the time of offering a trip to Panama.